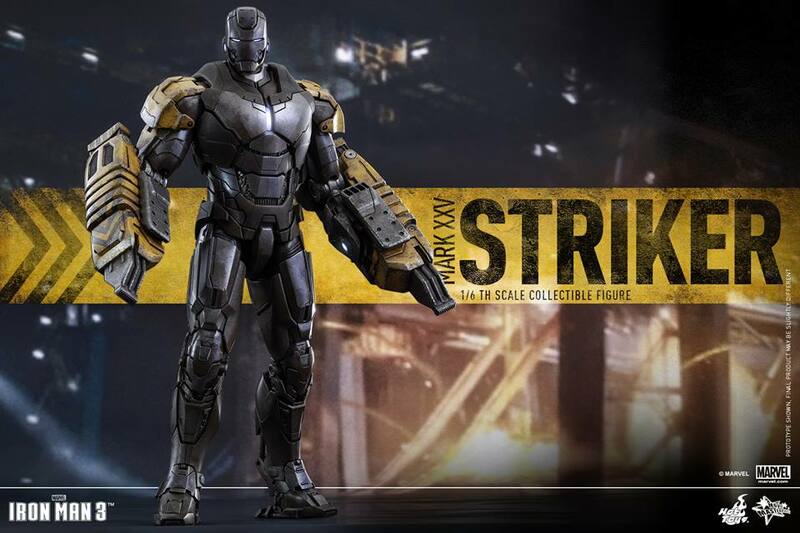 The House Party Protocol continues at Hot Toys as they have posted images and info for another Iron Man 3 Armor. 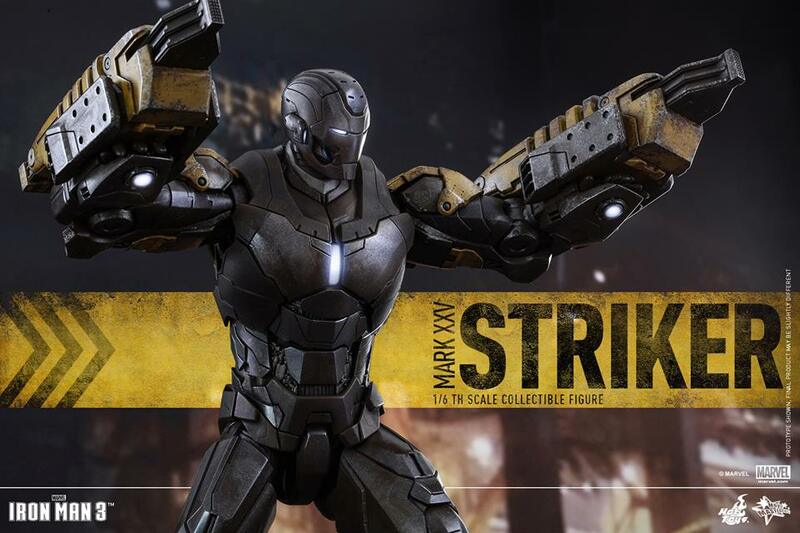 The Iron Man 3 Mark XXV Striker Armor 1/6 Scale Figure is the construction themed armor with arm-mounted hammers. 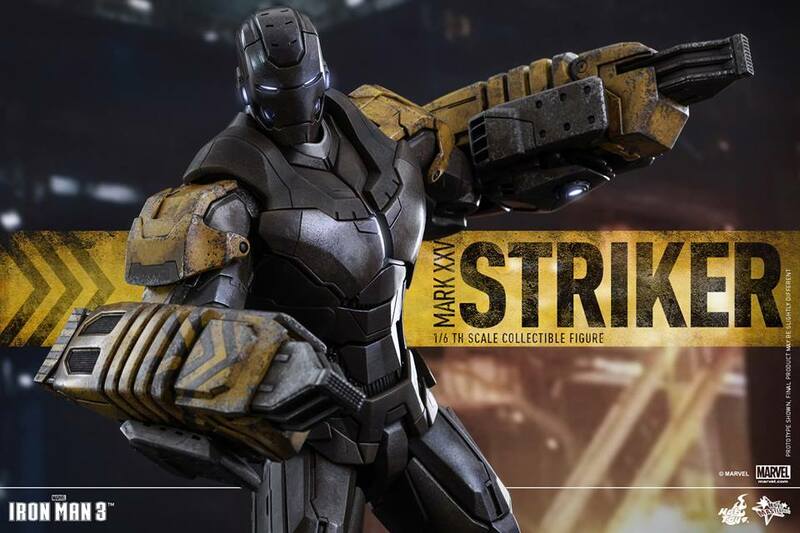 The figure will stand over 13″ tall and feature over 30 points of articulation. 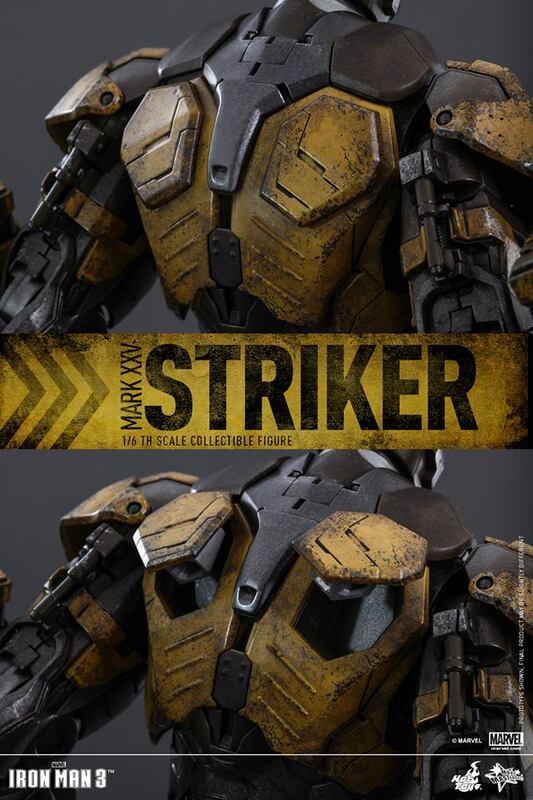 The hammers, eyes and chest will feature LED lights and the Striker Armor will include a figure stand. Read on for the images and more info. “It’s Christmas. Take them to church.” – Tony Stark. 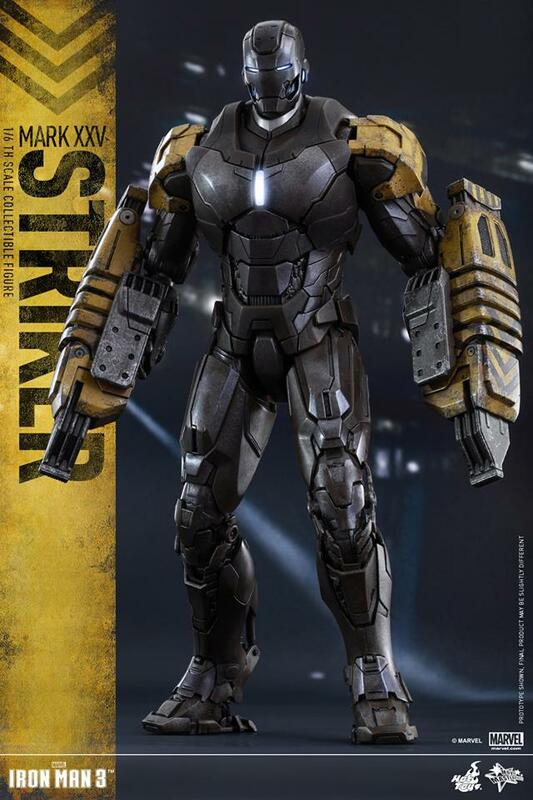 One of the suits Tony Stark has built in Iron Man 3 is the Striker (Mark XXV), the Heavy Construction Suit. 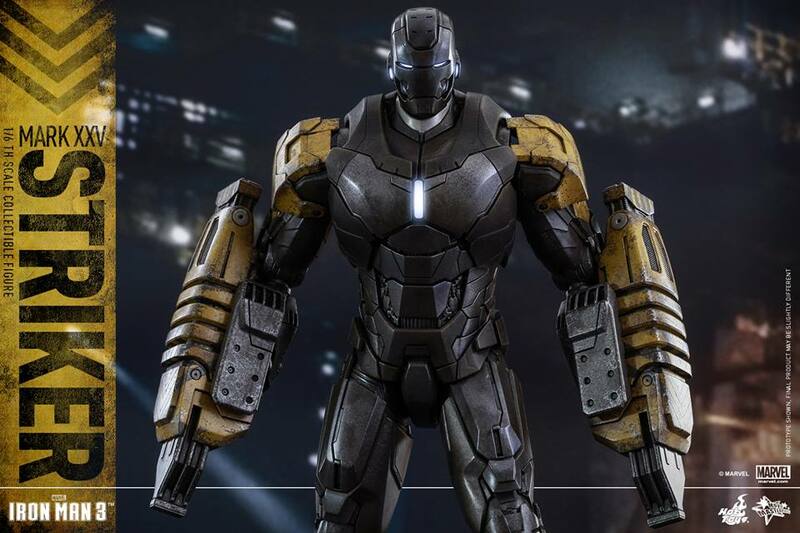 This suit is designed for assisting in heavy construction with its distinctive Pneumatic Hammers. 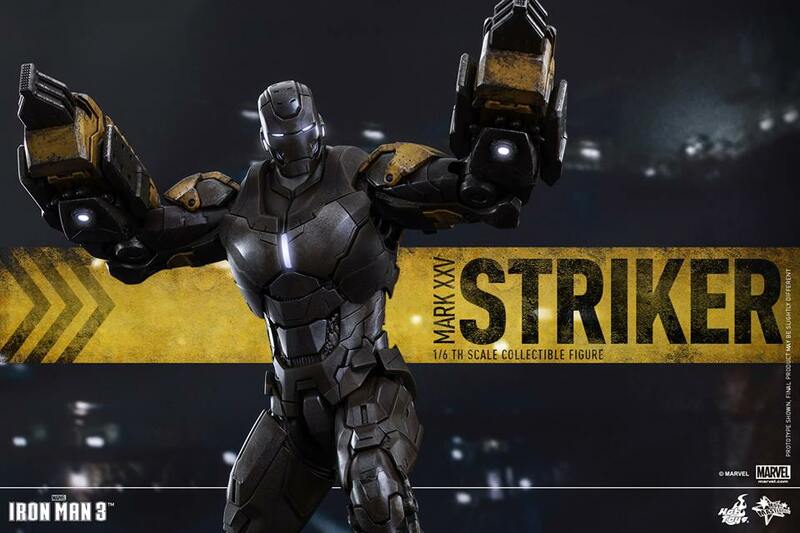 Although the hammers are not designed for combat, they still proved to be lethal when Striker assisted in eradicating the two Extremis soldiers who were trying to attack James Rhodes. 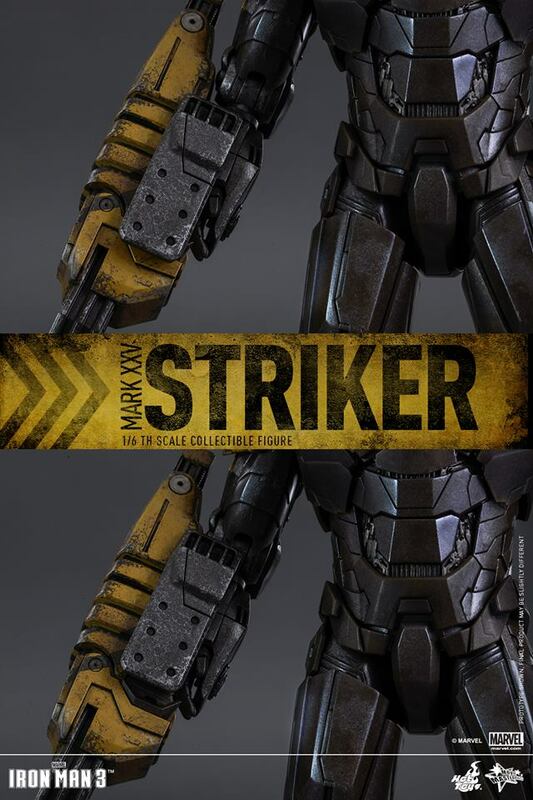 Today Hot Toys is proud to present 1/6th scale Striker (Mark XXV) Collectible Figure featuring the suit’s distinctive design with the pair of Pneumatic Hammers, special paint application with distressed effects, LED light-up functions and figure stand. Expand your House Party Protocol and add this unique suit to your collection! – Special Features: A pair of Pneumatic Hammers, special paint application with distressed effects, LED light-up functions and figure stand. – Artists: Head Sculpted by . gorgeous.. i wish i was extremely wealthy so i could own all of these.. or.. i wish i didn't collect so much other stuff lol. It is neat. Wish the hammers could be replaced with regular arms. I don't understand the position of his hands. 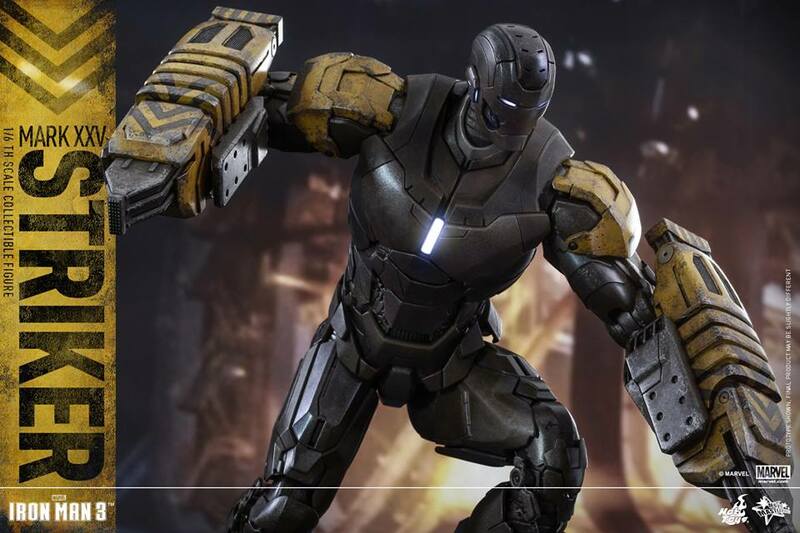 Does the armor come off his hands & then slide under? Because the length from his elbow to the hands is ridiculously short. There's no forearm. I'm confused. 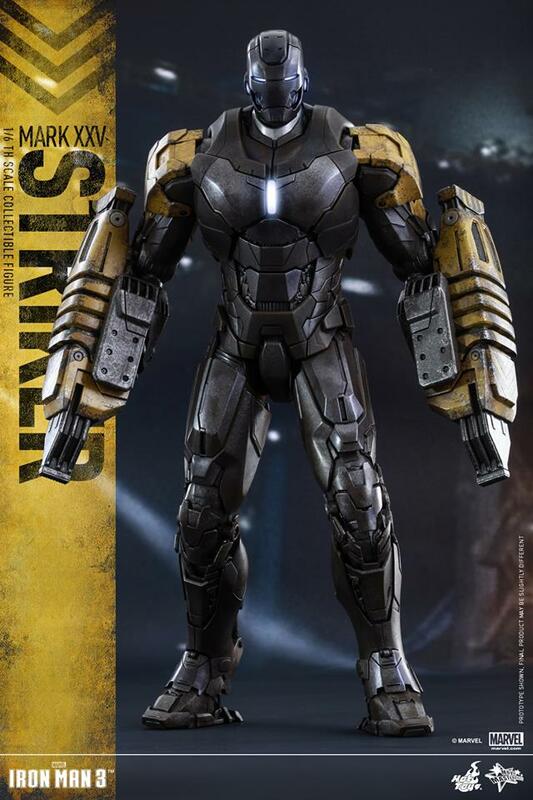 All yawning aside, this is one of the cooler armors from the House Party Protocol. Of course, there's no way in hell I'm ever going to buy one of these. Changing gears for a moment, I rewatched IM3 recently, it is actually a bad, bad movie. I adored it and saw it a few times in theatres, but honestly it's an incredibly cheesy movie that, to me, totally misrepresents Tony Stark. It took me a long time to remember, because Tony sucked for so long in comics, that the RDJ version of Tony is just not Tony. It took me a long time to remember, because Tony sucked for so long in comics, that the RDJ version of Tony is just not Tony. That's why RDJ is the reason I now LIKE Iron Man, because HIS version of Tony Stark is awesome versus the original, comic book version, being utterly depressing and jerky. RDJ is STILL jerky, but in a cocky-funny kind of way. 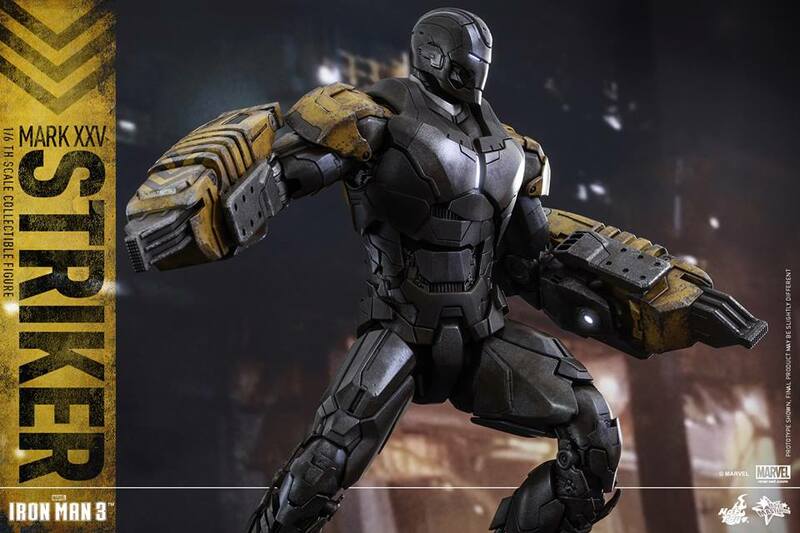 Also, in my personal opinion, IM3 is better than IM2 with one major glaring fault...Pepper Pots clothes after going through fire must have been made out of magic! 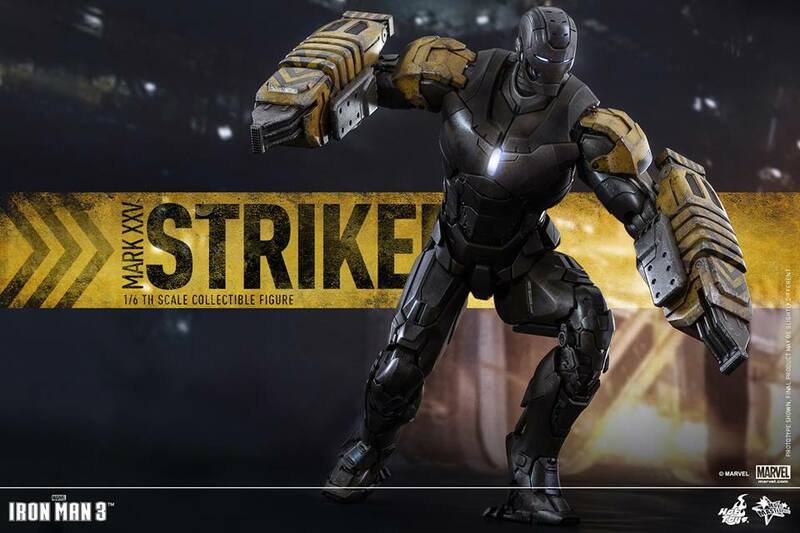 Striker armor looks great! Way better than Hot Toys last release of the "house party" Hot Rod repaint. BTW, Iron Man 2 was good and so much better than 3! Avengers movie should of been Iron Man 3... The comic book version of Tony Stark is what makes him so original and less Disney like. RDJ is the only man who can capture the true essence of the character IMHO. To be clear, I didn't say IM2 was NOT good, I just preferred IM3 better. IM2 felt like a bit of a repeat of IM1. The final fight wasn't satisfying. Just my opinion though. To each their own. I too found IM3 disappointing. The storytelling seemed plodding and piecemeal, lacking a plan and direction. What was the point of designing oodles of different suits if the viewing audience isn't to get more than a glimpse of them in action, and then only under cover of near-darkness in the moments immediately prior to end credits? 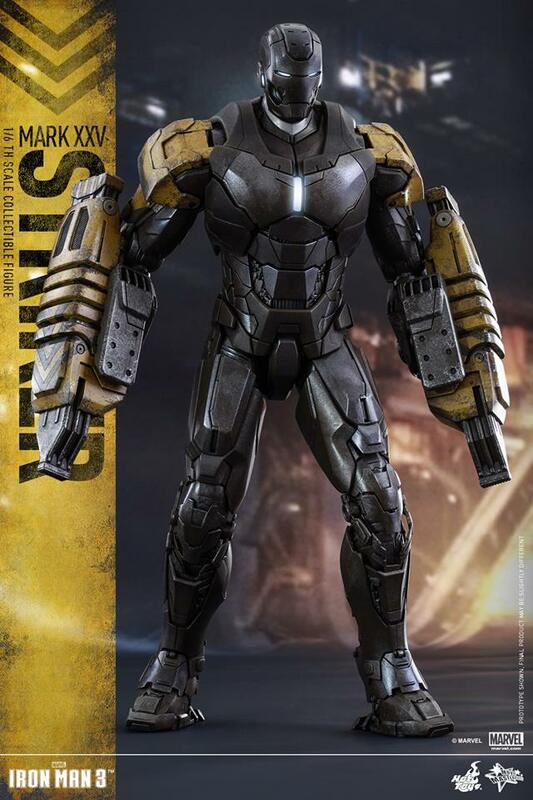 The only suit we saw in daylight was Mark 42, a dull-painted, clumsy lemon that kept malfunctioning and falling apart, hardly the kind of thing that builds enthusiasm among collectors for an action figure. I guess one point of IM3 was to show more of Stark's human side, like James Bond without gadgets, learning to cope with his panic attacks and get in touch with his inner child. Meh. The movie did make one valuable point: figures in the media aren't always what they seem. 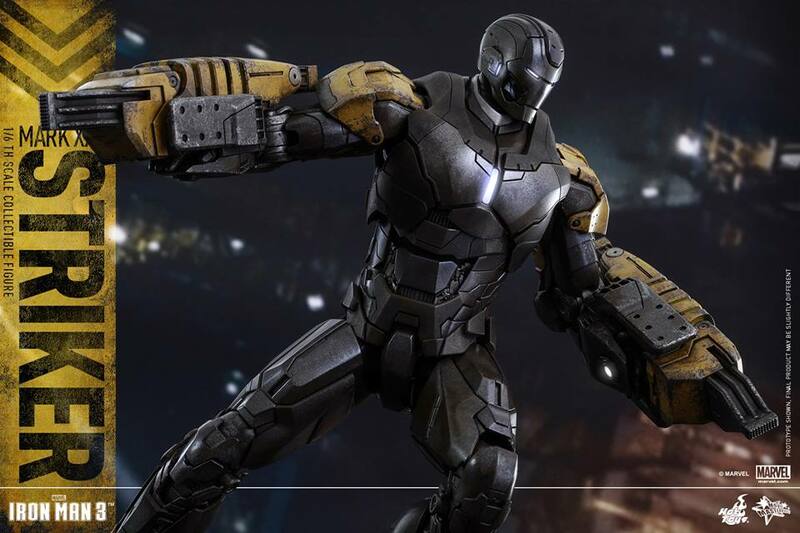 If somebody asked which model I would like most to add to my 1:12 scale collection from the House Party protocol, it would be the Mark 2 in bright shiny silver, or the Python, Mark 20, with bright shiny gold trim. 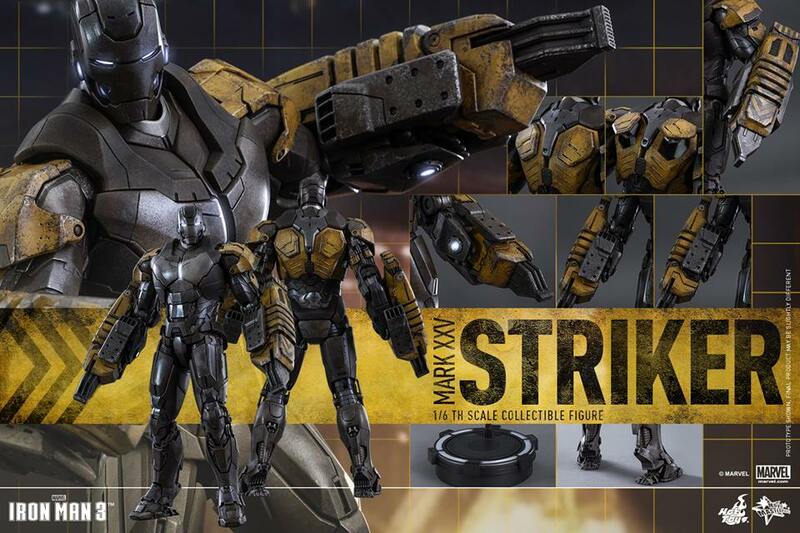 I hope Play Imaginative produces more than the basic three (Mark 42, Iron Patriot and War Machine II). All times are GMT -4. The time now is 4:09 PM.